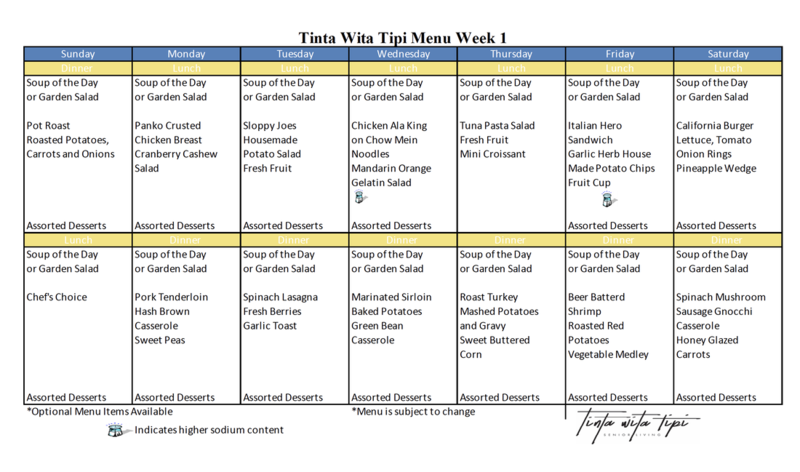 Tinta Wita Tipi Senior Living's dining program features a selection of meals, served at your table. Our menus include a wonderful mixture of local and traditional favorites, with seasonal specialities. Our culinary team strives to ensure our elders enjoy their dining experiences. Our skilled team prepares nutritious and delicious meals that make our elders feel at home. Freshly prepared and locally sourced produce is incorporated from Prairie Island Indian Community. We offer a variety of options for each meal so you can find selections in our dining experience that meet most dietary needs. The culinary team is available to meet with you to provide more detailed information and assistance. Do you have a family member or friend who is a current resident? visit tinta wita tipi and enjoy a meal with them! PLEASe call 651-385-3535 in advance to let us know you will be joining us.